Many children with Autism or other developmental delays benefit from the use of sign language. Sign language is another type of visual aid that helps stimulate the communication centers of the brain. If you engage in sign language with your child, they are able to take their visual aid (their hands) with them where ever they go! Using a ASL sign along with a verbal statement helps increase your child's understanding and language retention. By using the sign at the same time it gives your child a cue to visualize. 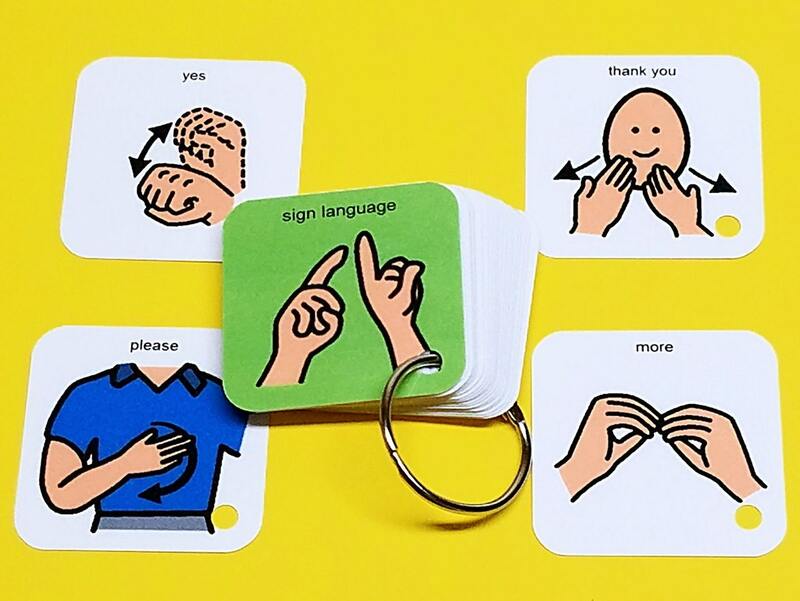 ***THIS KEYRING HAS ONLY (ASL) AMERICAN SIGN LANGUAGE SYMBOLS APPROVED BY THE AMERICAN SIGN LANGUAGE ASSOCIATION. Sign language helps increase your child's ability to have two-way communication. For some children with ASD this is their "key" to communicating. There are 24 symbols in all. They are larger 2 1/2 inch x 2 1/2 inch and printed in color on 110lb card stock and commercially heat laminated with 5 mil plastic. Each symbol is hole-punched in the corner, and placed on a silver, binder-ring style key ring. You can open it and remove any symbols you don't want or need, and rearrange them in any order. This is a great tool for beginning ASLers. You can even bring this to a caregiver, grandma's house, use to teach siblings, parents and friends. These are wonderful and so helpful for my son, thank you!